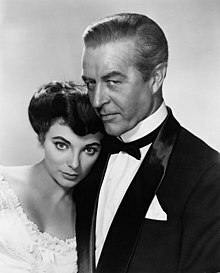 The Girl in the Red Velvet Swing is a 1955 American film directed by Richard Fleischer from a screenplay by Walter Reisch and Charles Brackett, and starring Joan Collins, Ray Milland, and Farley Granger. The CinemaScope film was released by Twentieth Century-Fox, which had originally planned to put Marilyn Monroe in the title role, and then suspended her when she refused to do the film. The film relates the fictionalized story of Evelyn Nesbit (Joan Collins). Nesbit was a model and actress who became embroiled in the scandal surrounding the June 1906 murder of her sexual assaulter, architect Stanford White (Ray Milland), by her husband, rail and coal tycoon Harry Kendall Thaw (Farley Granger). Writer Walter Reisch claims the film was his idea; he says 20th Century Fox were enthusiastic in part because producer Charlie Brackett knew Stanford White as a boy. Reisch estimates the film was 70% fact and 30% fictionalised. They tracked down Nesbit to get permission to make the film. Nesbit agreed in exchange for money although she was reluctant to do publicity for the film. Ragtime, a 1975 novel and 1981 film also treating the story of Nesbit, Thaw, and White. ^ "The Top Box-Office Hits of 1955", Variety Weekly, January 25, 1956 . ^ McGilligan, Patrick (1991). Backstory 2: Interviews with Screenwriters of the 1940s and 1950s. University of California Press. p. 240-243. Wikimedia Commons has media related to The Girl in the Red Velvet Swing. This page was last edited on 17 January 2019, at 13:26 (UTC).